Before you start spending any money, take some time to get a plan and some design ideas in your head. When you think about designing your deck, think big picture stuff. When you look at it that way, you will start seeing that the deck itself is just the canvas upon which your backyard picture is drawn. Three of the most important design features that will make your backyard picture come to life are railing, lighting and landscape elements. 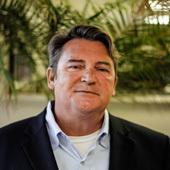 Brent Gwatney is Senior Vice President for Sales and Marketing for MoistureShield composite decking, and serves on the North American Deck and Railing Association (NADRA) board of directors. Brent has visited us before and has dropped by again to share his perspective with our DecksGo visitors about the most effective ways you can ramp up the "wow" factor on any backyard deck with three design considerations. You don’t have to be a professional to design a deck that will impress. Here are three easy ways to add accessories to your deck to create the outdoor living space you’ve always dreamed of. Railing is a safety requirement on most decks, but it doesn’t have to be just that. Take advantage of this safety feature by designing a deck with railing that stands out from the crowd. 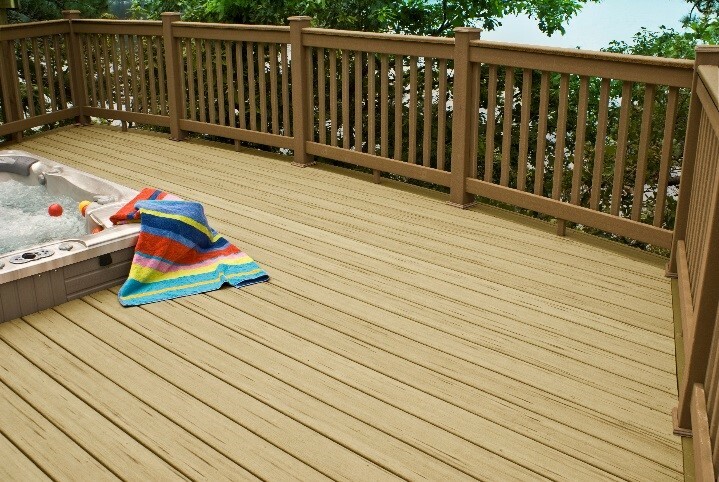 Some decking manufacturers offer railing options that match the color of their deck boards, and using these products can create a beautiful, uniform deck that is sure to stand the test of time. This isn’t the only option, though. With an expanding market of available products, you can also easily mix and match colors and materials for a completely custom design. 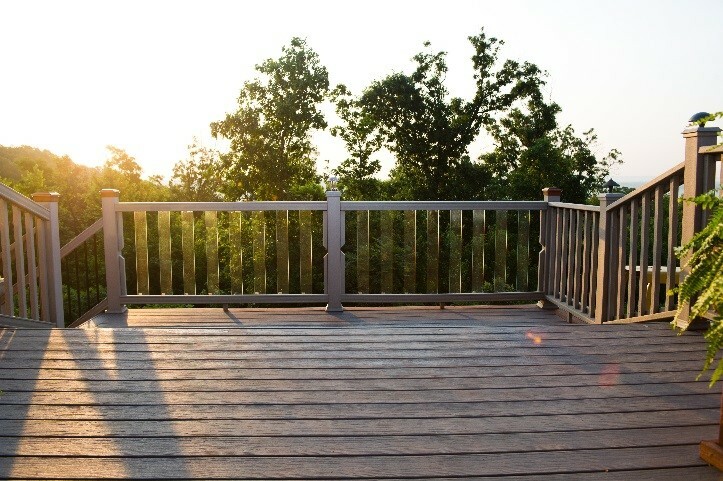 Aluminum railing systems like MoistureShield® Pro are one of the fastest growing accessories in the decking market and can bring a contemporary edge to any new or pre-existing deck. 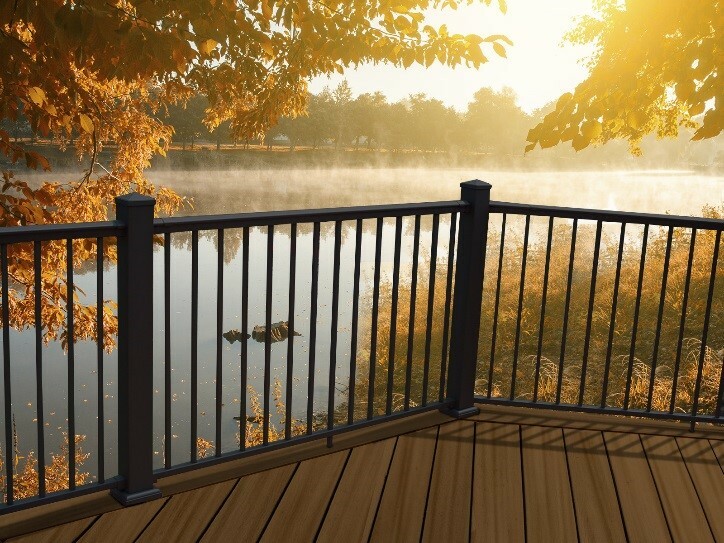 Aluminum railing also provides sleeker lines than most wood or composite options, giving you a better view of the landscape surrounding your deck. Mixed medium infills including glass panels and cable have also become more popular and can provide an even less obtrusive railing option to give your deck a high-end feel. You can even use your railing to enhance entertainment by using wide, flat rails that your guests can easily rest their drinks or elbows on. Deck lights are a nice upgrade that add value to the time you are able to spend on your deck, and good lighting on and around a deck can be the first step to spending your summer evenings enjoying the warmer weather. 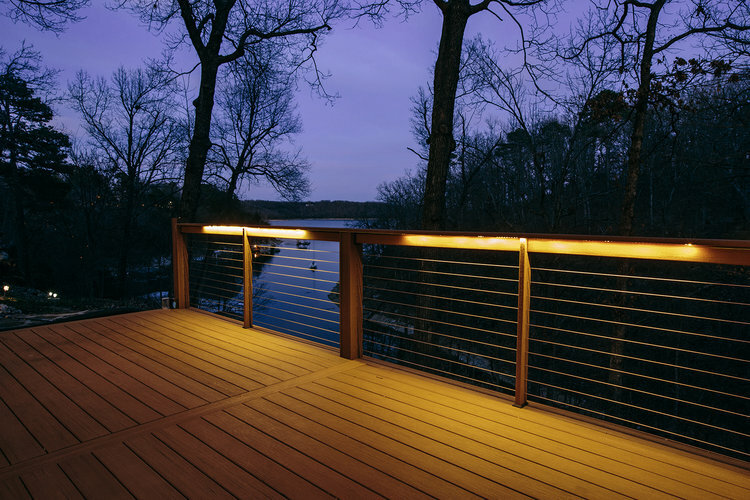 Do not underestimate the attractive effects of subtle but discreetly placed sources of light around an outdoor space like this cable railed deck overlooking a heavily tree covered lake. Now, more than ever, there are a plethora of easy-to-install lighting options available. Traditional post lights or cap lights can be complemented by strip lights hidden under the handrail, and bullet or recessed lights installed along stairs will help keep your guests safe without sacrificing style. As you choose railing and lighting options, you may begin to think of other ways to upgrade your deck. Extending a traditional one-level deck into other areas of your backyard will give your outdoor living space the visual appeal of a luxurious oasis. In larger spaces, water elements or backyard boardwalks can make something of any unused areas and extend the use of your deck. Homeowners who are looking to build beyond a simple, boxy deck can start with segmented or multi-level platforms. 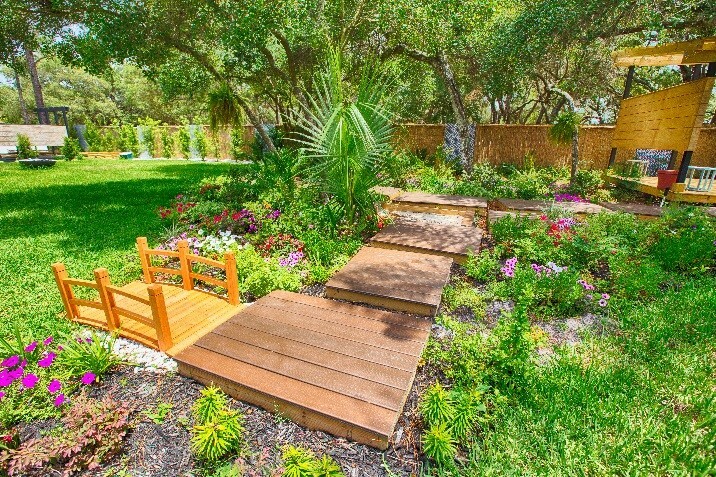 You can also design a deck around any existing landscape elements you have. Products like composite decking can be easily curved to work around trees or gardens, giving you the opportunity to customize a deck that is sure to impress. MoistureShield® composite decking can even be used in applications with ground or water contact, providing endless possibilities for you. 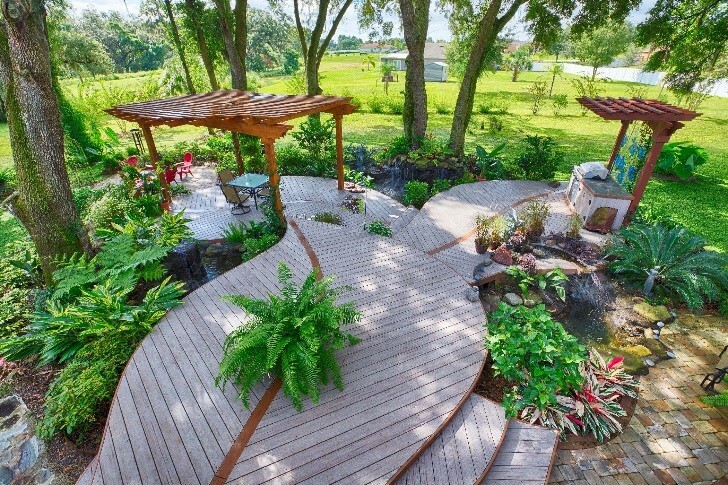 You can also design a deck around any existing landscape elements you have. Products like composite decking can be easily curved to work around trees or gardens, giving you the opportunity to customize a deck that is sure to impress. MoistureShield® composite decking can even be used in applications with ground or water contact, providing endless possibilities for you. Brent Gwatney is also on the board of directors of North American Deck and Railing Association (NADRA). He is a thought leader in the building materials industry always has interesting and valuable thoughts to share. You can learn more about Brent's company MoistureShield and explore the details of these materials further. Or just click the Go Learn button below. If you would like to be a featured author like Brent, contact us and let us know.